Marijuana tax law reform: Grover Norquist and Dana Rohrabacher boost the ultimate pot bill. The marijuana lobby searches for conservatives who hate taxes more than they hate drugs. Former Reagan speechwriter Dana Rohrabacher, now a Republican representative from California, is mellow about the advent of legal marijuana. The “ultimate marijuana bill” sits on a table, next to crudités and crackers but at a safe distance from the red wine. It’s Tuesday evening inside the new office of the Marijuana Policy Project, where the small but ambitious cannabis lobby has cloistered before swarming Capitol Hill. Rep. Dana Rohrabacher, R-Calif., who co-wrote the “ultimate marijuana bill,” is filling his cup before giving a short speech. Ben Wu, the young CEO of a new California-based company called Kush Bottles, is telling me why his product can lock marijuana away from minors and transform the image of the pot business. “All it takes is one bad event to get on CNN and discredit the industry,” he says. Over a few days this week, the National Cannabis Industry Association started a third year of selling Congress on quasi-legal federal recognition of marijuana. There are a few ways of doing this; H.R. 2240, also co-sponsored by Rohrabacher and Democrats, would end the tax code’s current prohibition on deductions or credits for businesses dealing with controlled substances, for any “marijuana sales conducted in compliance with State law.”​ Sixty-five representatives of the 450-member business association RSVP’d for the push. Most of them made it to the Hill. But the new cannabis lobby’s first problem comes straight out of the tough-on-crime push of the Reagan years. In 1982, the start of his iteration of the “war on drugs,” Reagan approved 280E, the line of tax law that prevents drug profit tax deductions. For decades it was a useful legal tool against dealers and an occasional source of would-you-believe-it news about people hiding their drug money. Only this year, with the birth of the legal marijuana industry in Colorado and Washington state, has this law produced the sort of victim that Congress tends to protect. Legal dispensaries are making millions and are unable to deduct the profits. They can’t convince banks to take their money or place ATMs in their stores. After a few weeks of Colorado sales, the Department of Justice issued a memorandum to prosecutors, asking them to lay off and let banks work with the dispensaries. “You can’t deduct rents, payroll, so it’s been a tough sale for us to come out and get capital from investors,” says Pete O’Neil, managing partner of Seattle’s C&C dispensary. I head over to the Heritage Foundation’s monthly Conversations With Conservatives panel, where marijuana’s not likely to come up at all. As it wraps I ask a few of the House’s most right-wing members, the guys who run the place, if there’s any interest in the cannabis bills. Texas Rep. Joe Barton, who’s been in the House since 1985, sounds utterly baffled when (with an assist from a more eloquent reporter) I explain the issue. A few minutes later, I pose the same question to Indiana Rep. Marlin Stutzman, elected in the 2010 Tea Party wave, and 27 years younger than Barton. He starts out criticizing the Obama administration for its abuse of power, which makes sense, as later in the day the House will pass a bill making it easier to sue the president. “The attorney general is, again, moving without Congress,” he says. “But I think that we should have hearings on it. We need to realize that there are consequences to laws and referendums that pass in the states when it comes to banks and interstate commerce. There are problems when we legalize drugs because of the infrastructure behind it. In other words: Sure, he’ll look at it. So will Alabama Rep. Spencer Bachus, the retiring chairman emeritus of the House Financial Services Committee, whom I talk to later in the lobbying day, and who is at least open to the idea of banks taking the money. When the day ends, I catch up with the lobbyists in the beige vending machine sector of the Rayburn Building. They sit and talk over packaged snacks and vitamin-infused waters. No breakthroughs just yet. Another lobbyist says this might have been a small victory. If Schumer isn’t concerned with the push, he’s out of “drug warrior” mode. He’s not going to oppose the bill—if the House actually moves the bill. If a trend-spotter like Schumer sees no upside in attacking legal marijuana banking or tax deduction (we are talking, after all, about a senator who briefly decided that the Dubai Ports deal was a threat to America), there are no enemies to the left. The next morning, on the last day of lobbying, the NCIA gather in the Cannon Building to package their message for the press. The hook: An appearance by Celinda Lake, a Democratic pollster who would explain that marijuana’s victory was preordained. 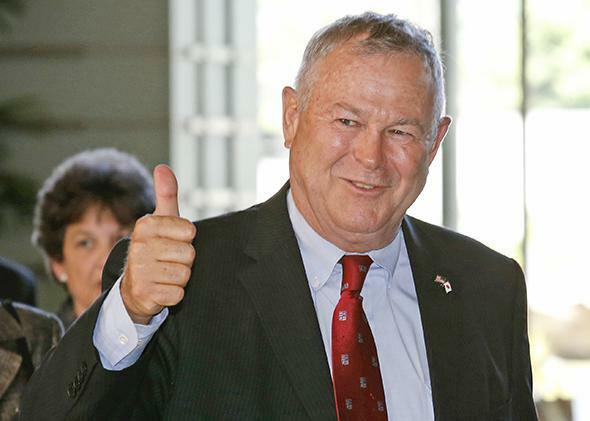 Rohrabacher sits in the first row of chairs, eyeing Lake with no apparent reaction. He gets up; he argues that his team should already be backing these bills, his bill especially, no matter whether progressives or the counterculture or whoever else are for it. *Correction, March 14, 2014: This article originally misstated that Dana Rohrabacher was discussing H.R. 2240 in his speech to the Marijuana Policy Project. He was discussing H.R. 1523.